Residents of the Hotel Travelers allege that their new landlord, Danny Haber, is trying to push them out of their homes. Last Friday, some of the building's residents filed suit against Haber to stop what they characterize as a pattern and practice of harassment. The Hotel Travelers is one of Oakland's dwindling number of SRO hotels. According to city staff, SROs are "naturally occurring" affordable housing that should be preserved, but recently, investors like Haber have purchased SRO buildings with the intent of remodeling them into boutique hotels or apartments for more affluent renters or tourists. Unlike San Francisco, Los Angeles, and other cities, Oakland has no laws to preserve existing SRO housing. According to the tenants' lawsuit, since purchasing the Hotel Travelers, Haber has reduced maid services, causing trash to pile up in the hallways, removed mailboxes and the 24-hour front desk service,making the building less secure, removed the building's wifi, and allowed the elevator to go unfixed for weeks, forcing elderly and disabled residents to walk up narrow flights of stairs. 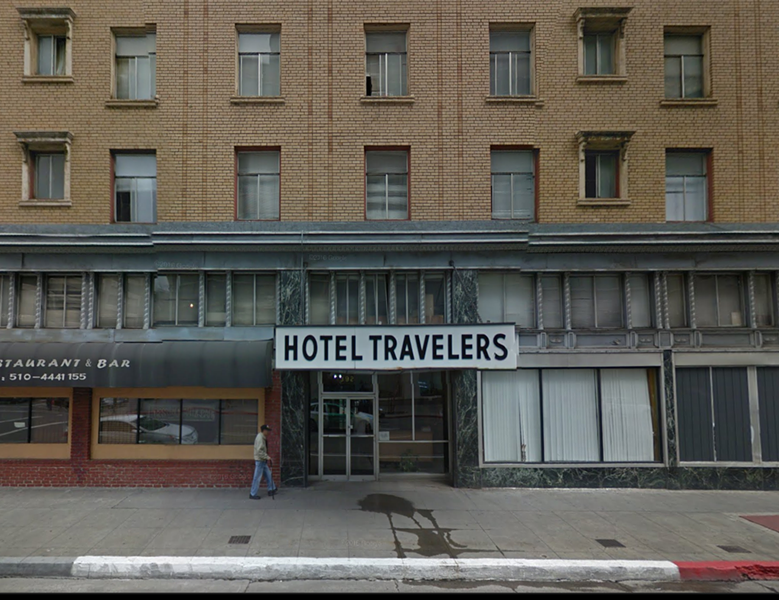 See also: Last Days at Downtown Oakland's Hotel Travelers? Residents say that Haber has already convinced all but two residents to vacate the 5th and 6th floors of the building, and that contractors have gutted the interiors of these floors to the studs and ripped giant holes in the ceilings. On Twitter, Joshua Daniels, who lives on the 5th floor, accused Haber of ripping the building's interior out without valid building permits. The lawsuit alleges that when residents of the 5th and 6th floors asked if they would be able to return to their units once the construction is completed, Haber told them only if they could pay $2,000 per month in rent. Most of the building's residents currently pay under $1,000 per month in rent. Haber also allegedly told the tenants that he planned to open a "beer garden" on the rooftop. Named alongside Haber in the lawsuit as co-defendants are Dion Ross and Alon Gutman. Ross describes himself as a "Executive Analyst Product / Project Implementations / Resource Relations & Logistics" specialist. Ross is managing the Hotel Travelers on a day-to-day basis for Haber. Reached by phone recently, Ross denied allegations made by the tenants in their lawsuit and said that all activities undertaken by Haber and himself have been legal, and tenants were provided with all proper notices. Gutman is a co-investor and co-founder of The Negev, LLC, a company he runs with Haber that converts housing into tech co-ops. Gutman and Haber reportedly named their company after the Negev Desert of southern Israel, and the historic efforts of the Israeli government to build settlements there. They purchased the Hotel Travelers in April of this year. Representing the tenants in their lawsuit is Robert Salinas of the Sundeen Salinas and Pyle law firm. Last month Salinas, along with Oakland City Attorney Barbara Parker, filed a similar lawsuit against James Kilpatrick after Kilpatrick purchased an SRO building on 8th Street inhabited mostly by elderly Chinese. Both lawsuits take advantage of Oakland's Tenant Protection Ordinance, a law Councilmember Dan Kalb wrote in 2014 in an effort to curb efforts by landlords to harass and displace lower-income tenants.